Each year, UNICEF Germany grants the “UNICEF Photo of the Year Award” to photo series that best depict the personality and living conditions of children across the globe. 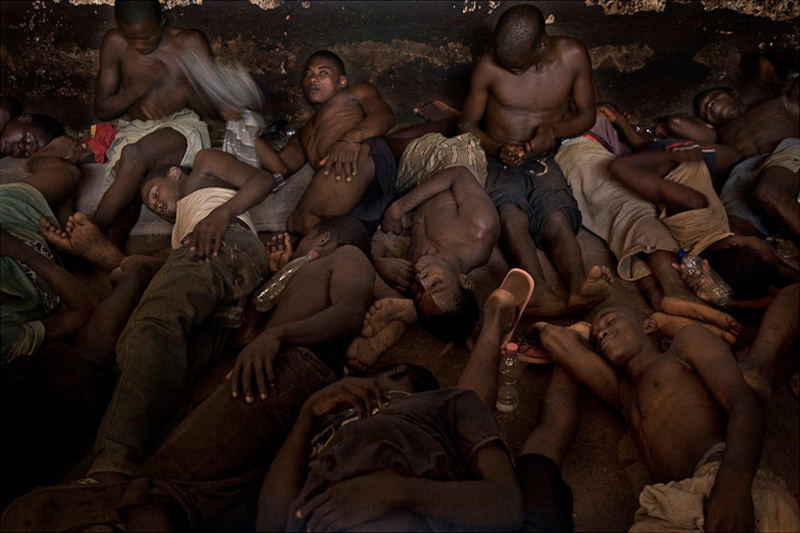 Among the 2010 Honorable Mentions was Spanish freelancer Fernando Moleres for his documents of children in Central Prison, usually known as Pademba Road Prison, in Sierra Leone’s capital Freetown. Click here, scroll down and click on his name to see the full UNICEF portfolio. Click here for Moleres’ full portfolio. 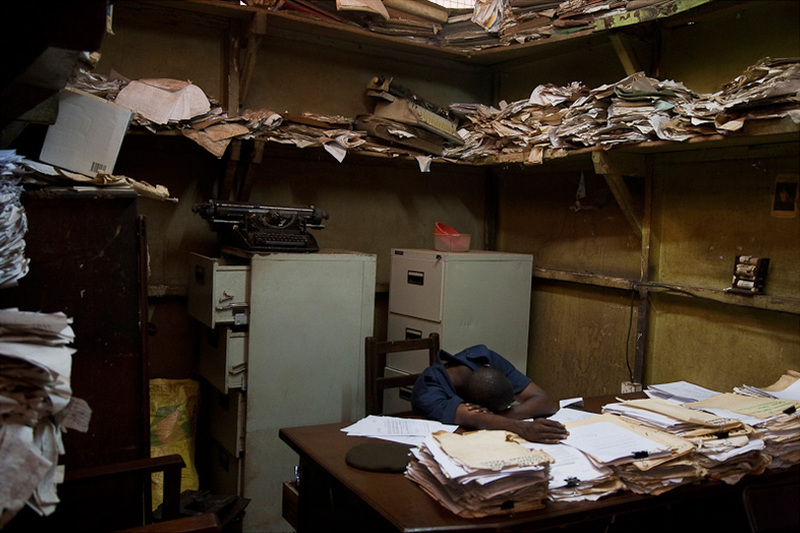 It’s often difficult to engage an audience with “new” images of prisons, but Moleres succeeded with the image of the collapsed official at his desk (above). The disorganisation of paperwork in this image works as metaphor for a broken institution – much as Hogarth’s littered furniture and bodies are metaphors for broken society. It also works as a foil (for those who are familiar with) to Jan Banning’s Bureaucratics portfolio; even those of Banning’s subjects amid seeming disarray, never appear defeated like Moleres’ prison administrator. “Pademba Road Prison was built for 300 prisoners, but it has more than 1,100 prisoners at present, many of whom are children,” explains Moleres. 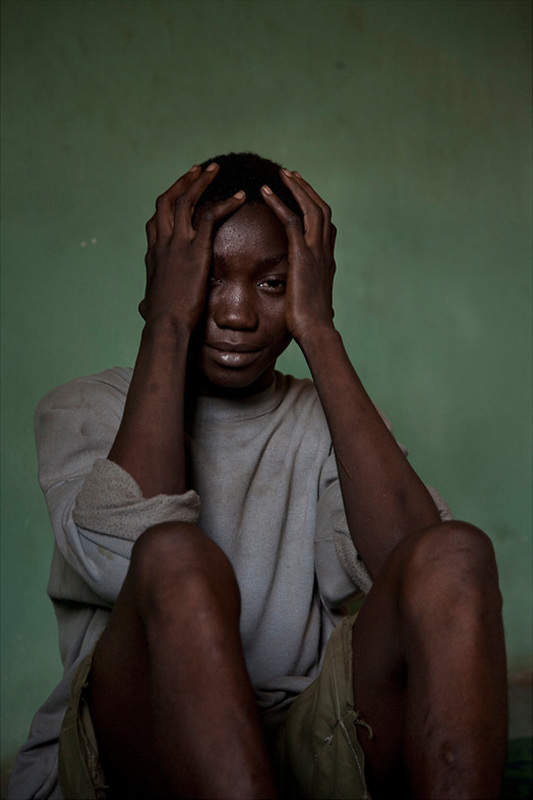 As an audience to this type of imagery, we should note that, in 2006, Lynsey Addario photographed in Pademba Road Prison as well as jails in Uganda. On the evidence of the photographs, conditions have not improved. Moreles paints a picture of a wasteful, desperate and predatory environment in Pademba Road Prison. This is the common view of prisons in many African countries, and sadly the reality for children caught in these systems. Many of Moleres’ photographs repeat the scenes of prisons photographed by others working in Africa, eg, Nathalie Mohadjer (Burundi), Julie Remy (Guinea), Joao Silva (Malawi) and Tom Martin (Burundi). The common threads of these portfolios is tension, filth, depleted light, malnutrition, overcrowding and the solitary gaze of a forlorn child. Prisons are most destructive to young lives that are not prepared for induction to the unpredictable environment. I would say this of prisons in America and the UK just as readily. UNICEF is right to shed light upon the most upsetting (and unseen) realities for the most disenfranchised children in our global society. Moleres also won the Luis Valtuena International Humanitarian Photography Award for his story on the prison system in Sierra Leone. Molores has photographed children and the issues that affect their since 1992. in over 30 countries. He has been recipient of a Mother Jones Grant, (1994), the “Juan Carlos King of Spain” International Prize (1995), an Erna and Victor Hasselblad Foundation Grant, Sweden (1996), a finalist for the Eugene Smith Prize (1997), World Press Photo award for “Children at work” daily life series (1998), W. Eugene Smith Prize, 2nd prize (1999), World Press Photo, Art category (2002), Revela International Award, Spain, (2009), Honorable Mention Philantropy Award (2010) and an Honorable mention for the Gijon international Prize. The prizes for the UNICEF Photo of the Year, 2010 went to First: Ed Kashi; Second: Majid Saeedi; Third: GMB Akash. I am overwhelmed by the strength of these images! Wow .. Pete that top photo is incredible. It just hit me so hard.